Roll a strip of cardboard or paper around a pencil to make a hollow tube. Tape the paper to hold the shape in place and remove the pencil. Cut the tube into 1″ or 2″ sections. Tape the bottom of each tube to seal it. Add a small amount of kitty litter (clay) to a tube and use the pencil to press it down to the bottom. Use the erase end to pack down the clay to make a plug. Add black powder or nitrocellulose to the tube. Insert a piece of fuse and continue adding powder around it until you are near the top of the tube. Don’t be stingy with the fuse. You want to get it into the gunpowder and make sure there is enough exposed fuse outside the firecracker that you can light it and get away from it before the fuse burns down to the gunpowder. You have a few options for sealing the tube. 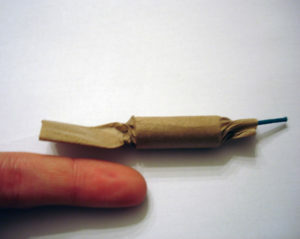 If you’re working with paper and plan to light the firecracker immediately, you can firmly twist the paper around the fuse to seal the firecracker. Another option is to top off the gunpowder with a small amount of kitty litter. Tape the top of the cylinder, leaving fuse exposed. 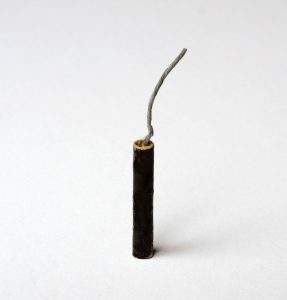 Finally, you can just tape the top of the firecracker, leaving exposed fuse. Experiment to see which design works best for you. Gunpowder or nitrocellulose are flammable and will explode if they are compressed when they burn. This, of course, if how firecrackers work! Make sure the materials only explode when you’re ready by keeping your work space away from heat and flame. It’s a firecracker, so it should be made by and lit by an adult.